Mindfulness For Relapse Prevention: Does It Work? Which Activities? Is It Possible To Use Mindfulness For Relapse Prevention? This entry was posted in Recovery & Support and tagged Managing Symptoms, Preventing Misuse, Treatment on August 31, 2016 by Team Addiction Hope. Sobriety is a lifelong commitment. Relapse may feel unlikely at times, but it only takes one oversight for past addiction to work its way back into someone’s life. New studies show that mindfulness-based relapse prevention has potential as a treatment method for people struggling to keep drug and/or alcohol addiction at bay. Even those with opiate and cocaine addictions – the drugs with the lowest recovery rates – are finding hope through mindfulness. Many people recovering from alcohol or drug dependency have one or two relapses along the way. Staying away from triggers can feel impossible, and for some it can prove to be too difficult. A relapse can be a simple moment of weakness resulting in a minor setback, or it may lead to a total dismantlement of everything a former addict has worked hard for. While sponsors exist to help recovering addicts, sometimes they are not enough to prevent a relapse. Some people start using and abusing substances again no matter how hard they try not to. Traditional treatment for relapse is similar to rehabilitation for the original addiction. The addict can seek refuge in a rehab center, go through withdrawal and restart a 12-step program. Today, research shows that mindfulness and meditation may have the power to prevent relapsing at all. Mindfulness is the act of being aware of one’s inclinations and behaviors in day-to-day life. Being mindful of an inclination to only want a substance to escape uncomfortable or undesirable circumstances can help an addict better understand and respond to feelings of discomfort. Instead of succumbing to a craving or feelings of anxiety, a mindful person can recognize the discomfort, observe it with compassion and respond in a healthy way. Mindfulness-based relapse prevention sessions are typically group-based. In each session, members meditate and practice cognitive and behavioral skills. Altering one’s lifestyle after addiction can be difficult, but mindfulness can train the mind to react to situations differently than before. Processes that are problematic to addicts become controllable with focused mindfulness and meditation. Learn more about mindfulness meditation here. The very root of addiction is an individual’s unhealthy relationship with discomfort. An addict uses drugs or alcohol to escape reality, alleviate depression or simply out of boredom. Mindfulness aims to change the mind’s natural inclination to turn to a substance in these scenarios. Understanding and working on emotions and one’s responses to them can decrease cravings and ultimately reduce the risk of relapse. Mindfulness takes a humanized approach, recognizing that we’re all human and we all make mistakes. It comes from a place of positivity, promoting inner strengths and focusing on what’s right with a recovering addict – instead of what’s wrong. Current studies show that mindfulness-based therapies are most beneficial as a complement to traditional treatment plans and recovery programs, not a substitute. People who get the most from this kind of therapy are those who have gone through traditional treatment multiple times without long-lasting sobriety. 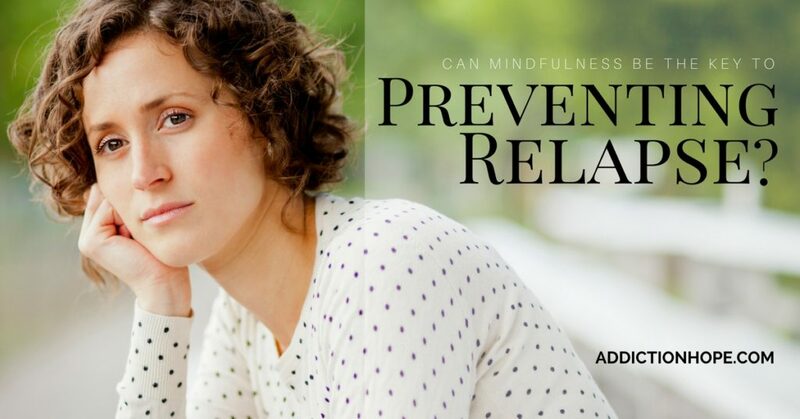 People who need something different, an alternative type of recovery therapy, may find their solution with mindfulness-based relapse prevention. RiverMend Health Centers, based in Georgia, are big believers in mindfulness as one of the pieces of the addiction-treatment puzzle. Learn more about RiverMend by clicking on the button below. How can mindfulness help you in your daily routine, whether it’s related to addiction recovery or otherwise? Please share your thoughts below.